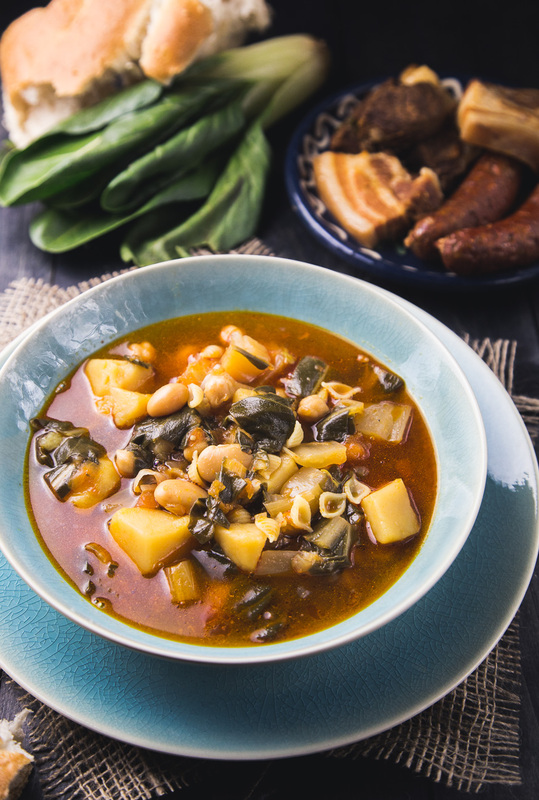 Winter is still dragging on here in Germany and while we’re all freezing and fighting colds, I’ll take you along on a little culinary journey to southern spain. 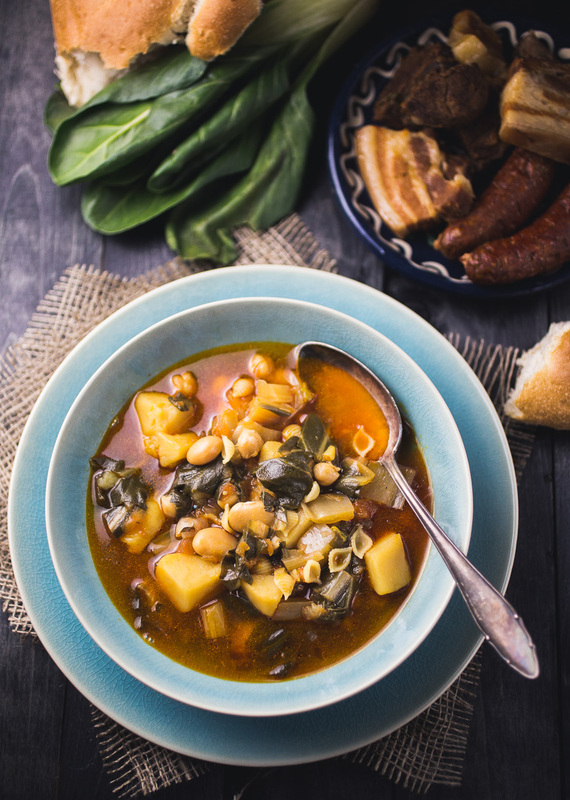 Today I have for you a hearty, warming recipe for potaje de acelgas – a spanish chard stew. 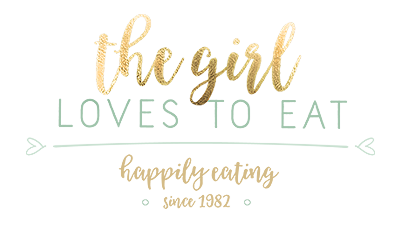 If you have been reading my blog the last years, you may have noticed that I like to post old recipes, that have been passed on in my family from generation to generation. 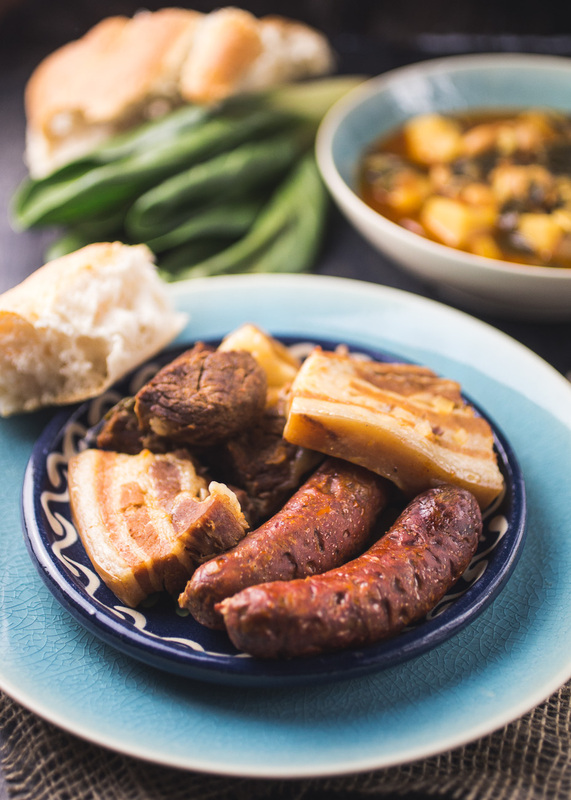 Especially the spanish side of my family has influenced my cooking a good deal and I love to share lesser known spanish family classics. Potaje de acelgas is a dish you probably won’t find in any spanish restaurants or touristy places in spain. This is a true family dish your gran or mother would prepare for you. The layout of a spanish stew as always pretty much the same: You always have potaoes, legumes, tomato, onion and garlic. Those are the basic ingredients and you add different vegetables, whatever is at hand. It can be cabbage, thistle or like in this case: chard. 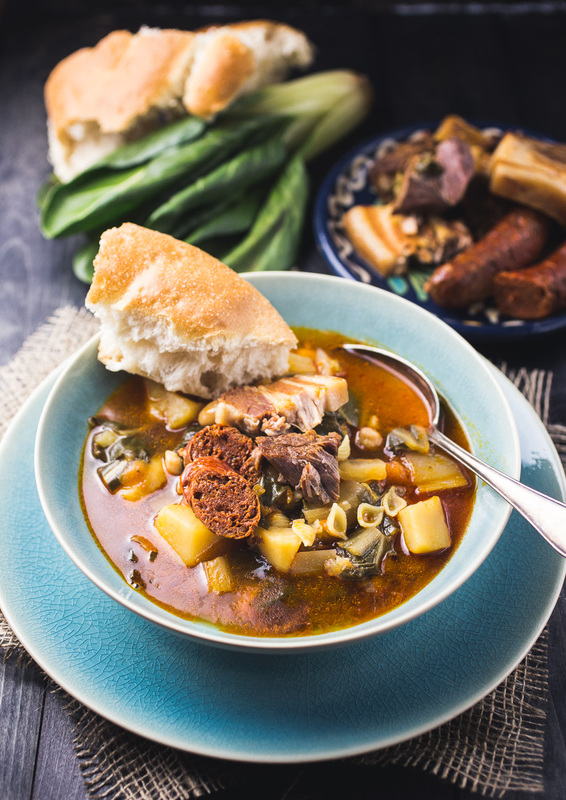 All those ingredients give the stew a distinct flavour. I clearly stated in the recipe that this is a pressure cooker recipe. Everyone in my family uses a pressure cooker when cheap cuts of meat are involved. Of course you could simmer the meat for hours until it’s tender, but then you have to add certain ingredients later, so they won’t desintegrate. The advatage of a pressure cooker is, besides the fact that the stew is done in 40 minutes, that you can just dump everything in and that’s it. In theory, and I haven’t tried this yet (! ), you could make this recipe in a slow cooker just as well. 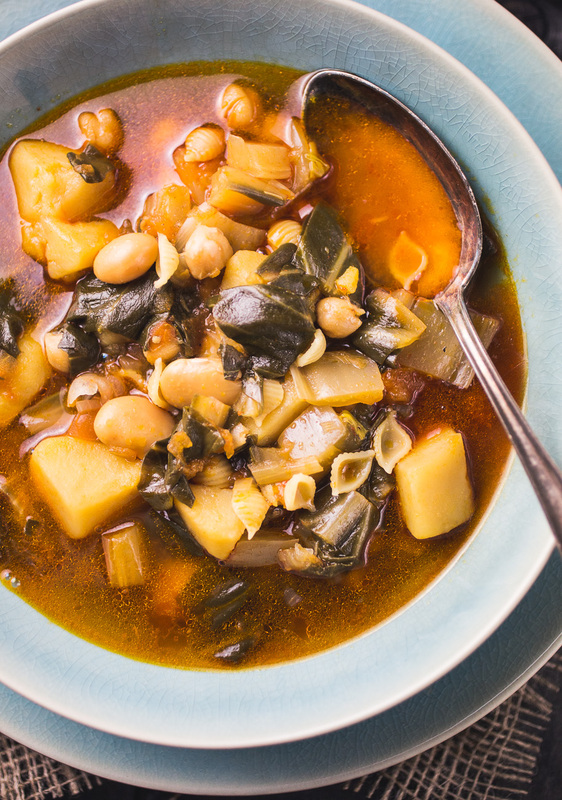 You would need to use canned legumes, instead of dried, but the outcome should be very very similar to the pressure cooker version. So, let’s talk about the meat. Every spanish stew, in my opinion, needs some meet. 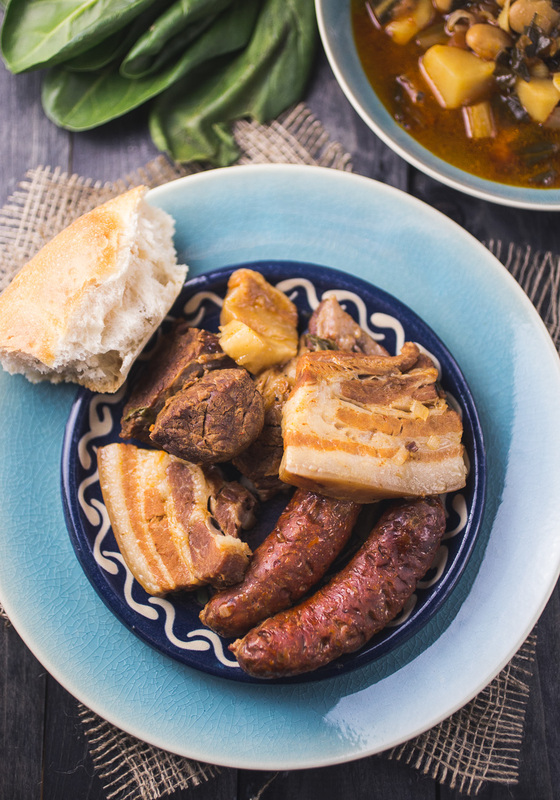 The classic combination is: Chorizo sausage, pork belly and beef shoulder (or some other beef cut suitable for stewing). Those are ingredients that are quite easy to come by. Harder to lay your hands on, if you’re not in spain, are morcilla (a spiced blood sausage) and tocino iberico (a fatty piece of bacon from the iberico pig). 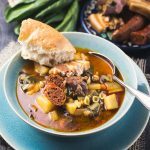 The last two are certainly the icing on the cake, but when the supplies I bring back from spain, run out I just make the stews without them and they turn out delicious. Let me just say a few quick word on how to serve and eat the pringá. The traditional way is to take out the meat after cooking ans serve the stew without it. The plate of warm, tender meat is then placed on the table as a small second course, together with some crusty white bread. Everyone takes a pice of everything, the beef and sausage is cut up into chunks and eaten, while the fatty parts of the bacon are dipped up with bread. In my family, however, some people, including myself, like to cut up some of the meats and mix it right with the stew on the plate. It just tastes amazing together. But decide for yourself what you like best. 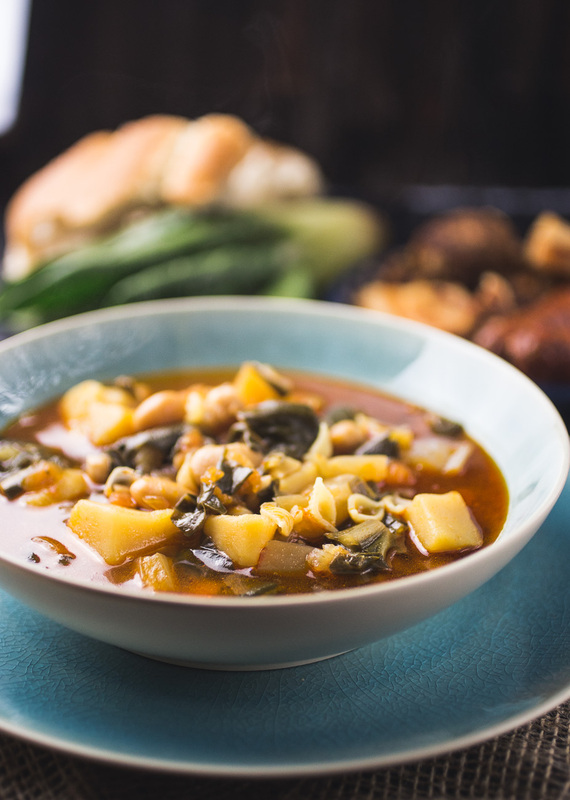 Chard, potatoes and legumes stewed with hearty meats. If you're using dried chickpeas and beans, soak them in water the night before. 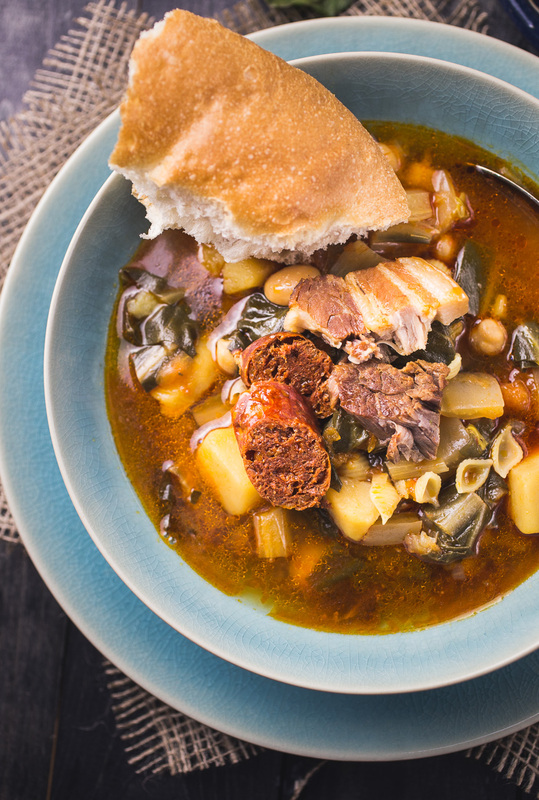 Canned legumes can be used right away. Wash the chard, cut it into 2cm pieces and add it to your pressure cooker. Peel the potato, cut it into large pieces, around 4-5cm, and add the to the chard. Add the chickpeas, beans, tomato, tomato paste, onion, garlic, salt, pepper and all the meat. Add water to the pot until everything is generously covered. Close the pressure cooker and cook everything for 30 minutes on high pressure. After 30 minutes open your pressure cooker, add the noodles and let everything cook over medium heat for another 10 minutes. Take out the meat and sausage and serve separately. 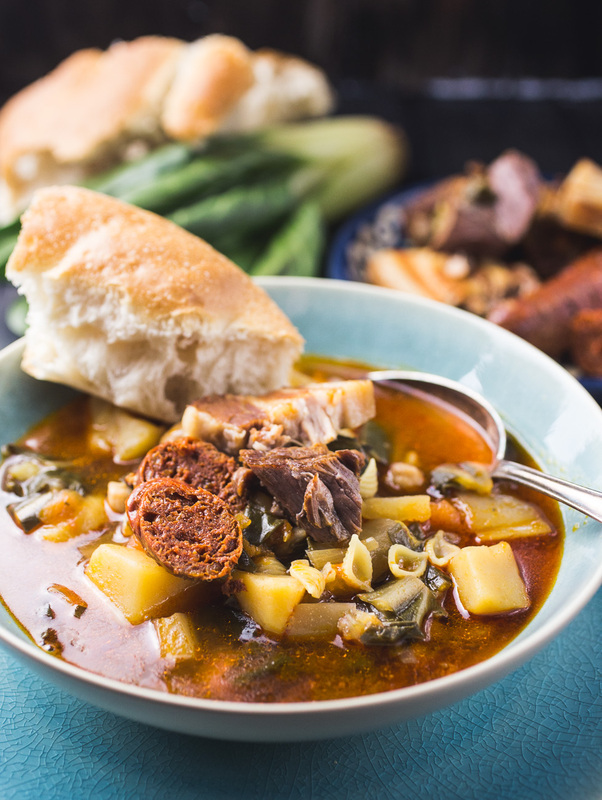 Let your guests cut a bit of meat into their stew or serve it as a second course with some white bread, as it is the tradition in spain.